Memory foam mattress toppers are a great budget alternative to buying a new mattress and can take your bed to the next level of comfort while providing greater support for your back. Goodbye aching back hello fresh happy morning! But before we delve into the depths of this guide let’s take a look at some of the things you need to know before you choose a memory foam mattress topper. I’ve put all the top picks for the best memory foam toppers into the table below. My personal favourite is the Panda Topper, it’s the one I sleep on and it is really comfortable. As I’m sure you know mattress toppers are an extra layer of padding you put on top of your bed to make it more comfortable. What you might not know is that Memory Foam was actually developed by NASA for use in aircraft seats. The aim was to develop a comfortable seat that could be sat on for long periods of time without causing pain or discomfort. Exactly what you want when you’re going to be lying down for 8 hours! Now memory foam mattress toppers are used to add extra comfort to your bed but they are also designed to help ease the pain of a bad back. Now if it’s neck pain you suffer from, consider checking out our Pillow Reviews. They are much more suited to curing neck pain and could be just what you need! Memory foam is super comfortable! There are no two ways about it, if you want to feel like you’re sleeping on a cloud then look no further. Memory foam is designed to evenly distribute your weight so that there is not to much pressure on any part of your body, the result? A bed that you can’t wait to get into. No more jagged spring poking through, no more lumps that seem to follow you around the bed. It is an absolute dream to sleep on (Pun completely intended). I actually prefer memory foam mattress toppers to regular memory foam mattresses. With a memory foam mattress, you tend to sink in quite deep and I feel like I get stuck, I then stay in that position all night and wake up with a stiff back. The opposite of what you want! Now with a topper you can get at thinner one so that you don’t sink in all the way and you can still move around while you sleep. Perfect. For many people, memory foam is needed to fix a bad back. Well that comes from having your weight evenly spread, it means there isn’t pressure on any one part of your body so you can sleep soundly knowing your spine is properly aligned and got all the support it needs. If you’ve recently suffered a back injury this could also be a great solution to sleepless nights. Check with your doctor first but it’s an easier solution to a good night sleep than a whole new orthopaedic bed! Nothings perfect and memory foam does have some draw backs, but a lot of the time it’s cheap memory foam giving the good stuff a bad name. The most common problem people get from memory foam is overheating. Memory foam can be prone to trapping a lot of heat because it’s dense and can’t distribute it, that leaves you way to hot all night long. Luckily a lot of manufacturers have been working hard to remedy this. You just have to look for some sort of cooling gel listed with the product, Panda for instance have Hydro Gel which is a special cooling gel mixed in with the memory foam to help with the heat problem. Which I’d say it does. The other problem you can often face is that it doesn’t spring back fast enough so you roll over and get stuck in your own dent. More of a problem in memory foam mattresses but it can be a problem in toppers too, but again this tends to only be in cheaper products. That brings us to the main event! Finding out what the best toppers actually are! I’ve broken them down into different categories based on what your needs might be. I’ve covered everything so I’m sure you’ll find what you need! Memory foam can often lead to hot sweaty nights spent tossing and turning. No fun right? Panda agreed and came up with Hydro Foam – a memory foam mixed with a cooling gel that helps regulate temperature and keep you comfortable all night long. Wrap that up in a breathable bamboo cover and you’re left with a pain-free back, cool comfortable nights and a smiling face in the morning. As a massive bonus you can sleep comfortably for a decade before you have to think about replacing it. A 10-year guarantee is just unheard of amongst mattress toppers and makes this the best value topper on the list. 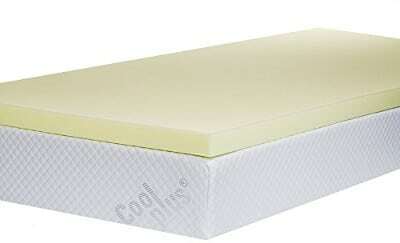 Verdict – Hydro Foam coolness and value for money easily make this one of the best mattress toppers available. 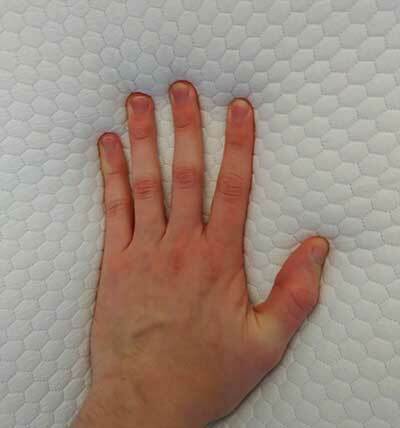 Read the full Panda Mattress Topper Review here. 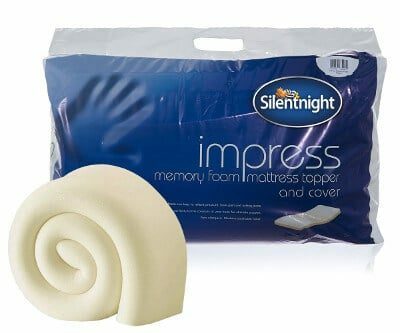 The Silentnight Impress is the perfect all round memory foam mattress topper. It’s available in two different sizes 2.5cm and 5cm. The 5cm thickness allows you plenty of room to sink in and get great support for your bad back while the 2.5cm is great if you’re looking for a comfort upgrade. It’s also a really great price, the John Lewis topper below is definitely more luxurious but also a whole lot more expensive. And price is definitely an important factor so it shouldn’t be left out. If you’re not sure which depth chose for I’d say the 5 cm is definitely the one to go for. It just offers more comfort and support compared to the 2.5cm. Finally, it’s got a removable cover which is machine washable which is a nice final touch. Silentnight have been in the business for over 70 years so you know you are getting a quality product. This topper is available for single, double, and king-size beds and comes with a 2-year guarantee and a cover. 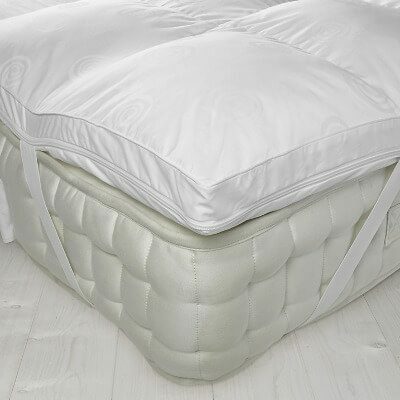 Verdict – The Impress memory foam topper is the best all-round topper. It will give your bed as serious comfort upgrade while helping ease a bad back. John Lewis have really outdone themselves with this mattress topper. The ultimate in luxury comfort and superb for back support. The catch is it’s a little pricey so won’t be for everyone. But if you can afford it do it. You’ll feel like your sleeping on a cloud with the 6cm depth. It will absolutely get rid of back pain and any other joint pain you might wake up with. And when you consider you spend a third of your like lying in bed it’s a worthy investment to make. 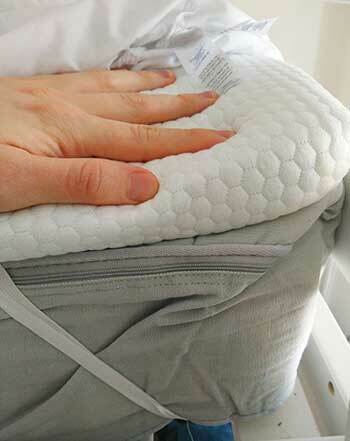 The micro fibre helps keep some of the worst of the heat out and the handy straps on each corner keep it in place on the bed, they fit up to a 35cm deep mattress as well. A worthy investment that will last you years to come. Let’s keep it nice and simple at the start of the list with a cheap and cheerful option. *Note If you suffer from a bad back please consider an alternative to this topper. It will provide you more comfort on your bed but it will not do much to help persistent back pain. This is a bit debatable as to whether this topper is actual memory foam or not. It is definitely closer to plain ol’ foam but this is the budget section after all so you get what you pay for! Available in four sizes: single, queen, double and king. It is also available with or without a cover. The cover helps increase the life of your topper and is easily removable so it can be washed at home. Perfect for improving a lumpy bed and giving you a nice comfy sleep. The Eggshell mattress topper is designed to stimulate airflow underneath you as you sleep getting rid of excess heat and ensuring you have a cool night sleep. Because there’s nothing worse than waking up covered in sweat in the middle of the night! Available in single, small double, double, king, and super-king. The Visco Therapy Topper is suitable for any bed and perfect for those who tend to overheat through the night. Memory foam mattress all tend to have a bit of a funky smell when they’re first opened. My suggestion is to leave it out to air for 72 hours before you put it on your bed. This will also allow it to fully spring out if it’s been stuck inside of a vac-packed package. Can I cut the memory foam down to a smaller size? Yes and no, you can but it will leave the edges a bit ragged and if done wrong could cause the whole thing to fall apart. So if you do decide to cut it make sure you use something very sharp and use a cover to reinforce it to make sure it doesn’t fall apart on the bed. Yes they are! All memory foam mattress toppers are naturally hypoallergenic and dust mite resistant. This is because the material itself cannot be penetrated thus it cannot trap dust inside of it. Will this help with neck pain? It definitely won’t hinder neck pain but it is unlikely to improve it. For treating neck pain you are much better off getting yourself a new pillow. Have a look at our pillow buyer’s guide for more information. Will I need to get a bigger sheet? If you want to put the mattress topper under the bed then if you get a thicker one then you will likely need to get a bigger sheet. It depends on how big your current one is but you may have an extra 4” to cover up! Hello there, I have lower back problems, S1. Recently having had an accident at the gym. I’ve decided I need to buy a topper. You say Panda is the best. I’ve also read many reviews regarding the eve mattress topper and would like your opinion on this please? Hi Nicola! I would say it has to be the Panda Topper out of the two!